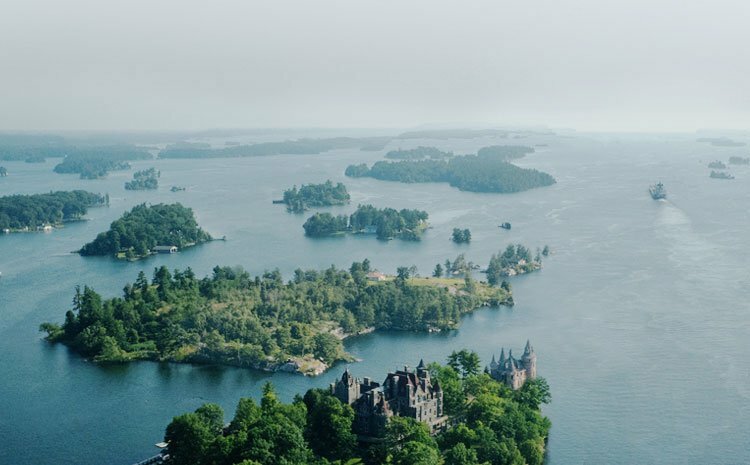 Few places on this Earth are as captivatingly beautiful as the 1000 Islands. The islands that we see today, were once the tops of an ancient mountain range -shaped and forged by over 10,000 years of glacial movement as the frigid Ice Age came to an end. Today, we are left with a magnificent and world famous destination that has been capturing hearts and imaginations since the first set of human eyes beheld it. 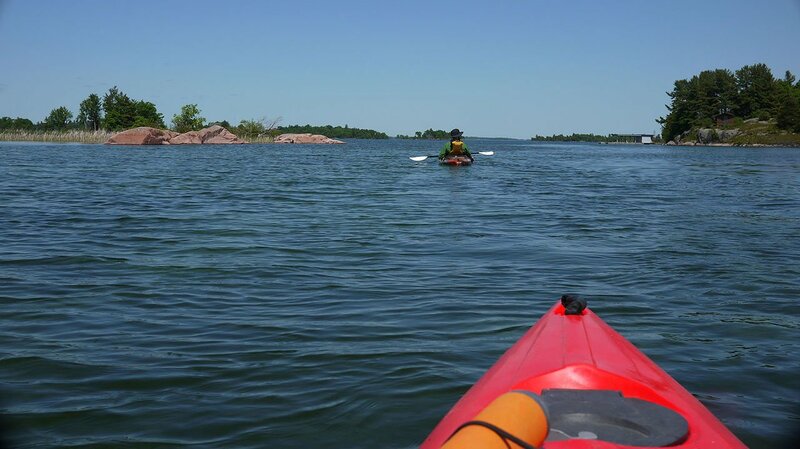 For this exciting chapter, Heidi and I would be embarking on an extensive adventure on the St. Lawrence River with a certified guide from 1000 Islands Kayaking. 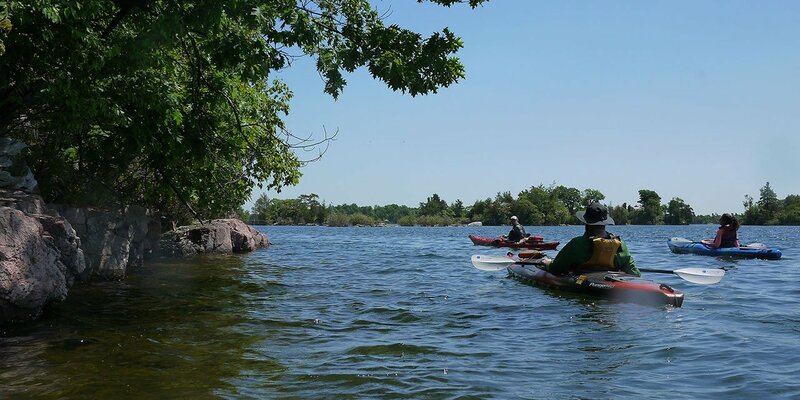 The journey would last the entire day, taking us throughout the Admiralty Islands, crossing several channels, and to some key points of interest throughout the river South of Gananoque. 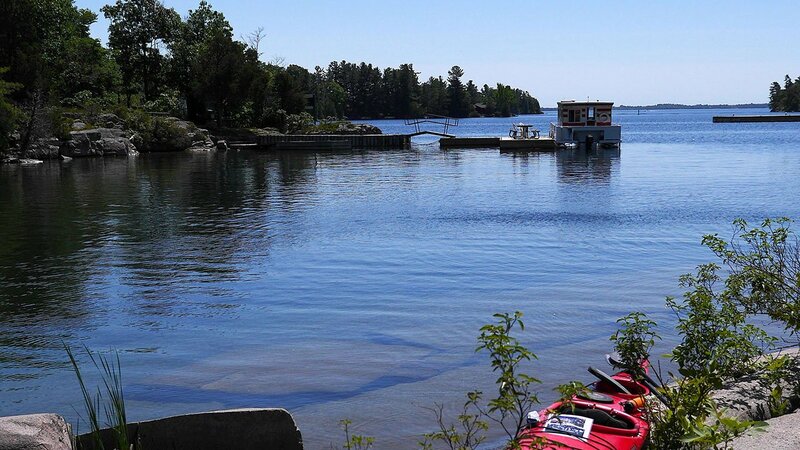 We arrived in town at 8:45 AM and quickly met up with the 1000 Islands Kayaking team at their location in a gorgeous historic stone building on Kate Street. After signing a few traditional forms and a quick Q&A about experience and safety we met Noah, our guide for the day. Also joining us for our trip was Chris and Nina – a very nice couple from Montreal, Quebec. Once we were fitted with some flotation vests, we suited up and carried our kayaks to a patch of grass just outside the building. Once we set our boats down, Noah had us sit in them and went over some basic balance guidelines and general safety tips. It was then that we realized that I was too tall for my Kayak. Quickly, Noah and another staff member brought out a brand new kayak with a more elongated seating compartment and a super cool black and orange camo colour scheme. They told me that its name was Midnight Tiger which sounds like a cool ninja and is totally awesome. Noah also told me that nobody had tried it out yet. This would be the maiden voyage of The Midnight Tiger. Once we cast off, I’m pleased to say that nobody tipped their Kayak which was in my humble opinion – a really good way to start. Noah guided us out of the marina and West toward Ormston Island. As we made our way out it was apparent that Heidi, Nina and Chris were all doing fantastic. 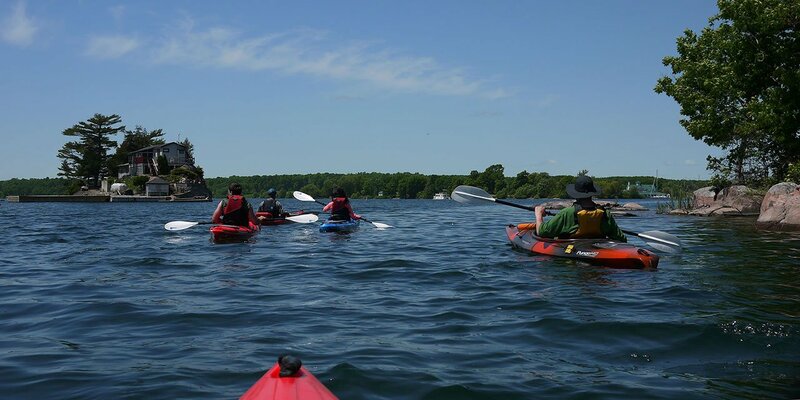 We all had experience in canoes, so controlling a kayak wasn’t all that different. In fact, it was smoother and more precise thanks to the dual-paddle and not having to constantly switch sides to move forward. I also found that sitting lower and much closer to the water level felt more stable and less tipsy than I thought it would be in comparison. As we rounded Ormston Island, Noah paddled out to the edge of the main channel to scope out any oncoming watercraft. After an all-clear signal we grouped up and made our first big crossing to McDonald Island. The water in the middle of the channel was more lively than closer to shore – but not too choppy. The winds were at a low level, which made for relatively mild conditions. From McDonald Island, we made our way further south through a tight cluster of small islands and shoals and arrived at the Northern shore of Mudlunta Island. 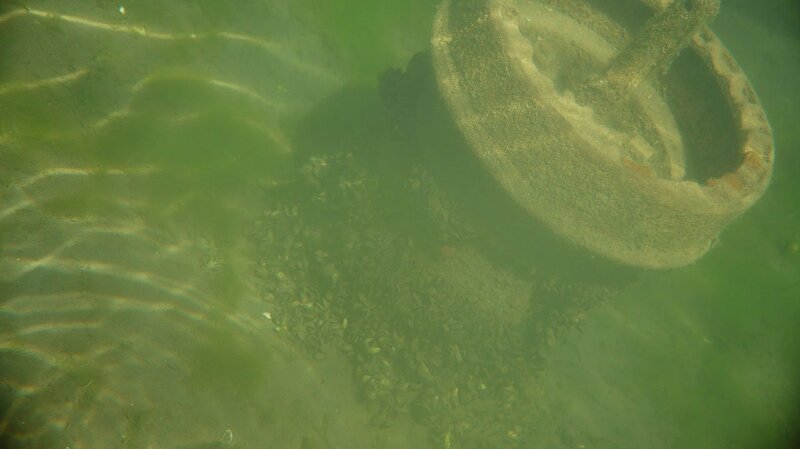 There, resting upon the shallows was the decayed wreckage The Briton, which was a coal Schooner built in 1872. After a career of hauling cargo, The Briton was later partially sunk and abandoned at her current resting place. 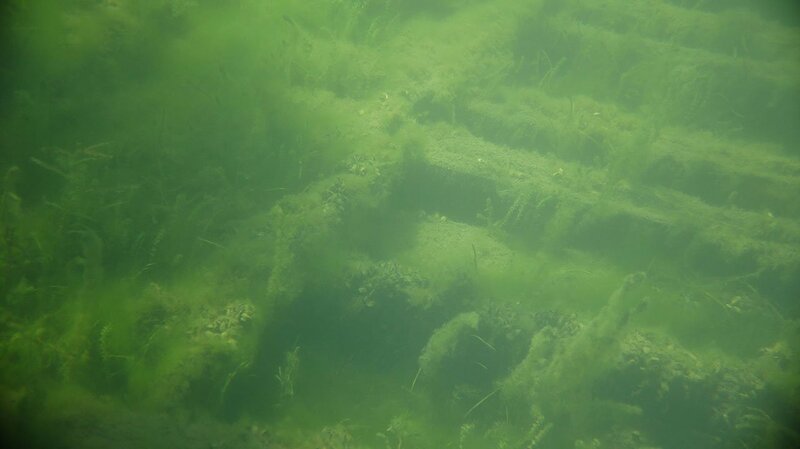 The Briton is but one of hundreds of shipwrecks in the St. Lawrence River, and it was fascinating to get so close to such an immense wreck without the need for scuba gear. She’s sitting in such shallow water, that a portion of Briton’s hull actually protrudes from beneath the surface, depending on the water levels. Sights like this are fascinating and certainly get the imagination racing. Pirates and warships once sailed and clashed upon the river, often meeting their end on the bottom. Although The Briton didn’t meet her end during a fantastic swashbuckling maritime battle, her tale is still interesting. After several years of being left derelict and the occasional rowdy party, the vessel was set ablaze, leaving her charred remains in the shallows. The next portion of our voyage took us through the fabled Wanderer’s Channel and the Admiralty Islands with a brief stop at the scenic Half Moon Bay. 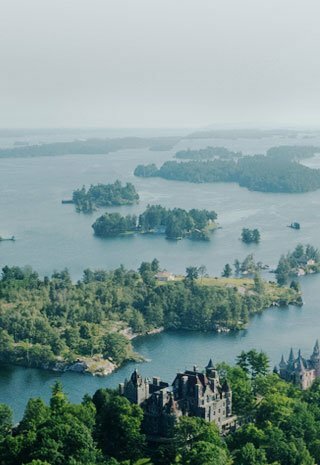 From there we proceeded North, around Bostwick – crossing the channel again, to the Southern edge of Lindsay Island and Westward to the small but picturesque Beaurivage Island for a chance to rest up, and refuel with a much-anticipated picnic lunch. Beaurivage which means “Beautiful Shoreline” in French surely lives up to its name. While Noah unpacked and prepped our picnic Chris, Nina, Heidi and I went on a short hike around the Island. I loved the mixture of lush green forested areas, and vast exposed portions of rock, their surfaces shorn smooth by glacial movement. 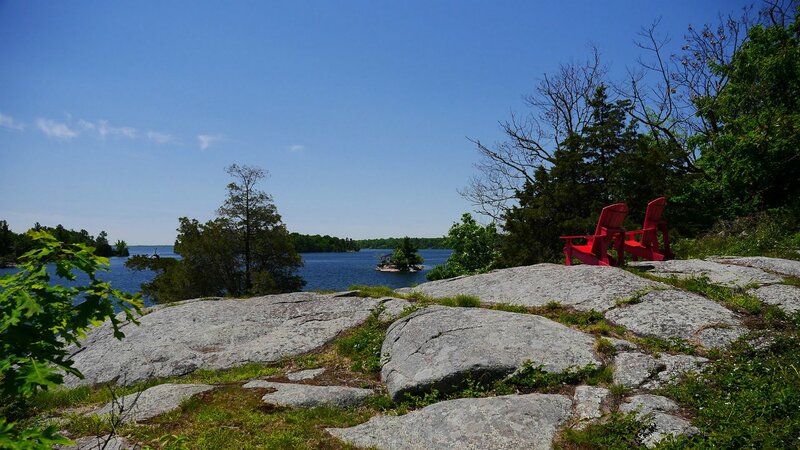 During our walk, we found a pair of Parks Canada’s iconic red Adirondack Chairs strategically positioned at a brilliant point overlooking the river. It was like something from a Group of 7 painting. The chairs begged us to have a seat and enjoy the majestic view of the flowing river and landscapes beyond. After enjoying the view from the comfort of those chairs, we headed back to where Noah had prepared a brilliant bounty of mouthwatering food to enjoy. From freshly sliced fruits including kiwis, oranges, apples and strawberries to fresh bread, cheese and deli meats this picnic was packed to the brim with healthy choices to help us recharge for the next leg of our journey. This was a great component of the day-tour giving us time to relax on dry land while sharing some great food and equally greater conversation with Nina, Chris and Noah. It was essentially like the coolest day camp for adults and the picnic lunch offered a great social element to the overall experience. With a proper lunch now in our bellies – we felt charged and eager to continue onward. After casting off from Beaurivage we proceeded South to the gap between the islands: Mermaid and Bostwick. From there we hugged the Southern edge of Bostwick past Blackduck and Hemlock Island(s) before turning North, passing through the Tiny Channel. After our break I felt even more confident in my ability with a kayak – and at times, I would peel ahead of the group without noticing. 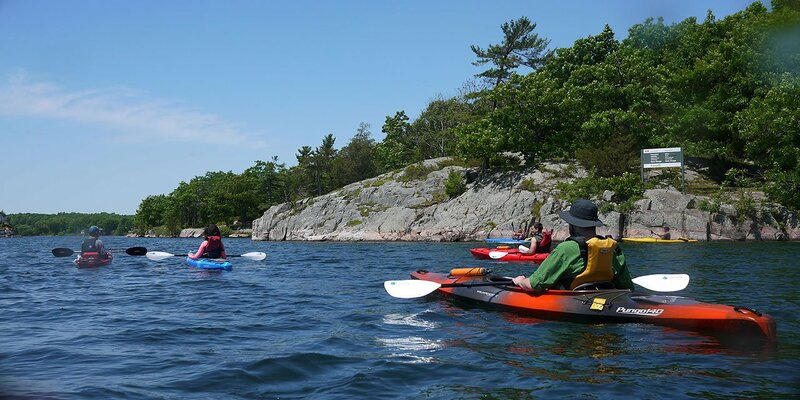 I took a real liking to kayaking – and decided that I will have to check out the certification programs available with the folks at Thousand Island Kayaking. The remainder of our trip was nothing short of spectacular. The full-day tour(s) are a fantastic idea for a family trip, or a group of friends offering a fun and active way to enjoy an unforgettable shared experience. 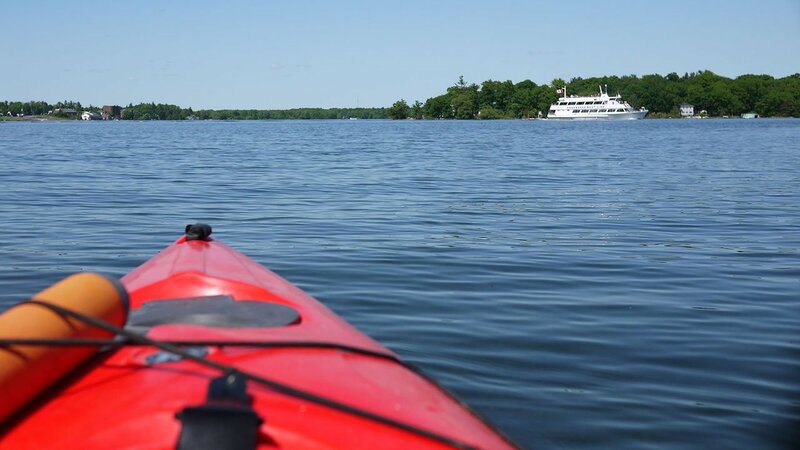 As we approached the main channel that would bring us back to the Gananoque marina – the winds died down to nothing and our home stretch was smooth as glass. Upon returning to Gananoque we checked into our hotel, got cleaned up and headed downtown to get ourselves a hearty dinner. Heidi and I had spent roughly seven hours out on the water and had built quite the appetite by this point. 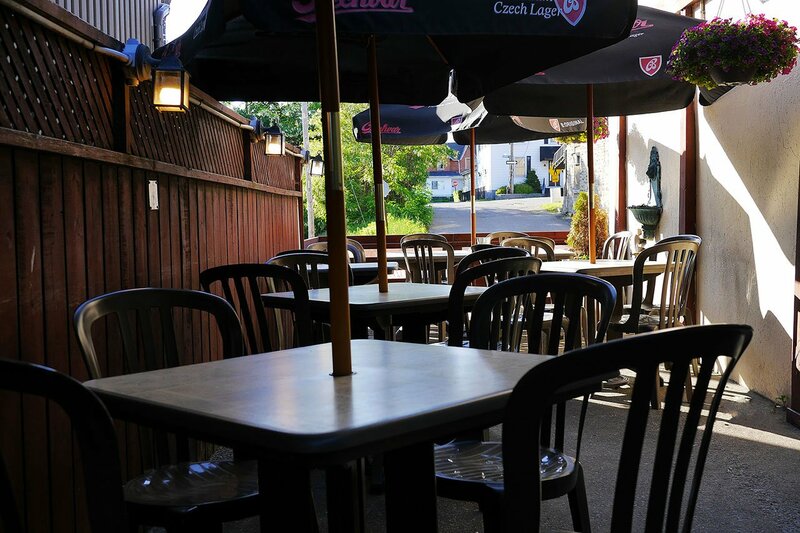 For dinner, we set our sights on the legendary Czech / Bavarian cuisine of The Maple Leaf Restaurant. The menu has a mouthwatering selection of Eastern European soul food – the likes of which would rival any Schnitzel Haus from the old country. Heidi’s father was a first generation Hungarian immigrant and master-chef, so she grew up eating this type of food all the time. 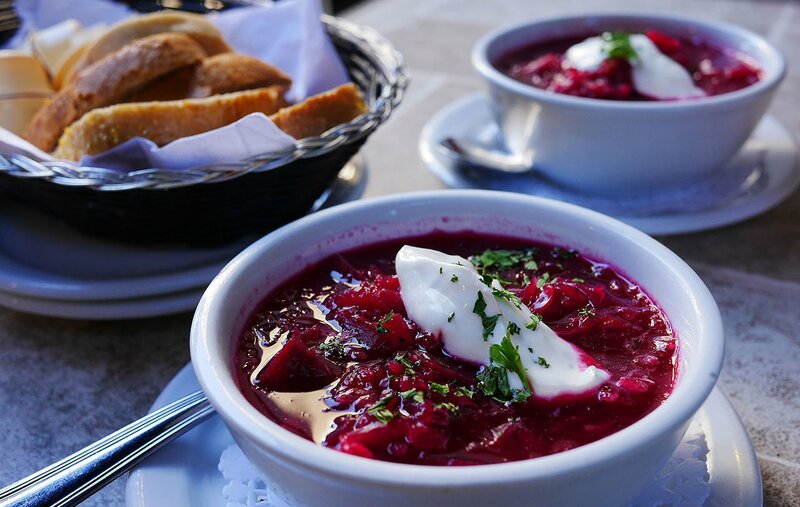 To start, we each enjoyed a flavourful bowl of Borscht which is a delicious soup made from beets. This is a staple dish found in several Eastern European cultures and variations of this dish have likely been enjoyed since before recorded history. 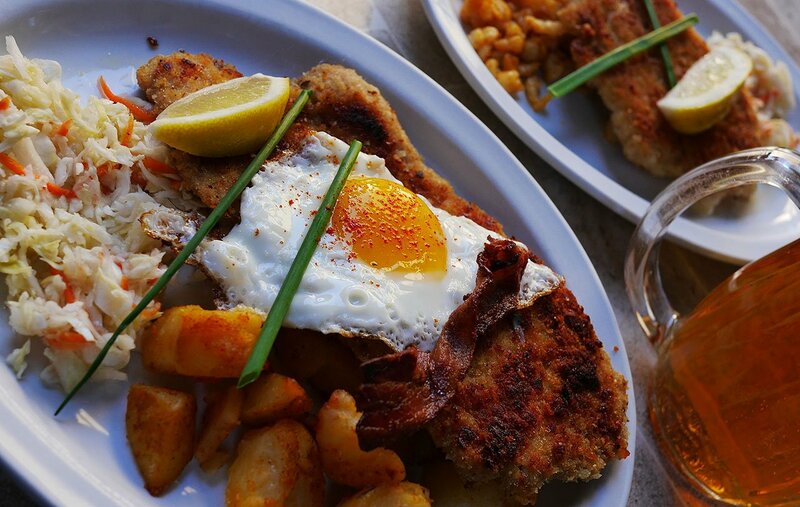 For our mains, Heidi chose the Prague Schnitzel which was a tenderized and breaded pork cutlet topped with a fried egg and a beautiful dusting of paprikash. It came with a pile of roast potatoes and serving of coleslaw. I ordered the Chicken Olympia which was a generous chicken schnitzel stuffed with cheese, spinach and prosciutto. On the side, I had a good portion of tasty spaetzle. Dinner was absolutely brilliant, and the huge mug of ice-cold pilsner I washed it down with was the perfect way to end such an eventful and active day. I also have it on Heidi’s good authority that each bite of the meal was a splendid flashback to home cooked traditional Eastern European food. 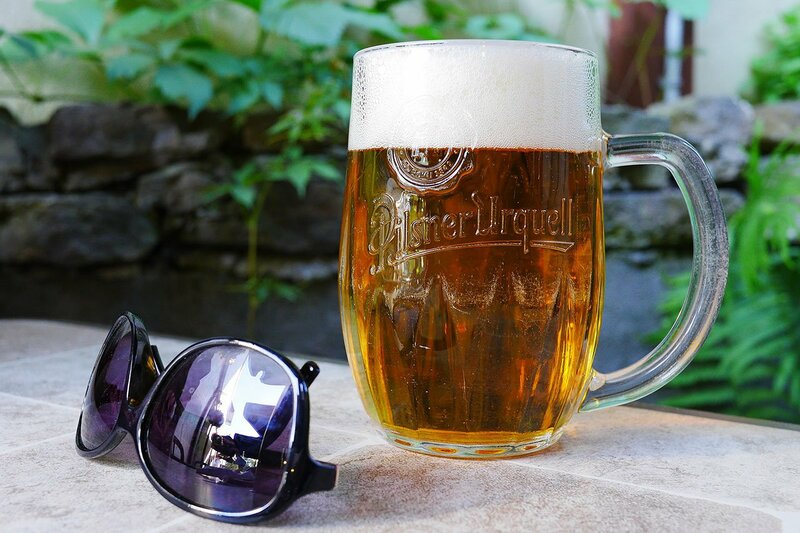 We can’t wait to go back and try the goulash! 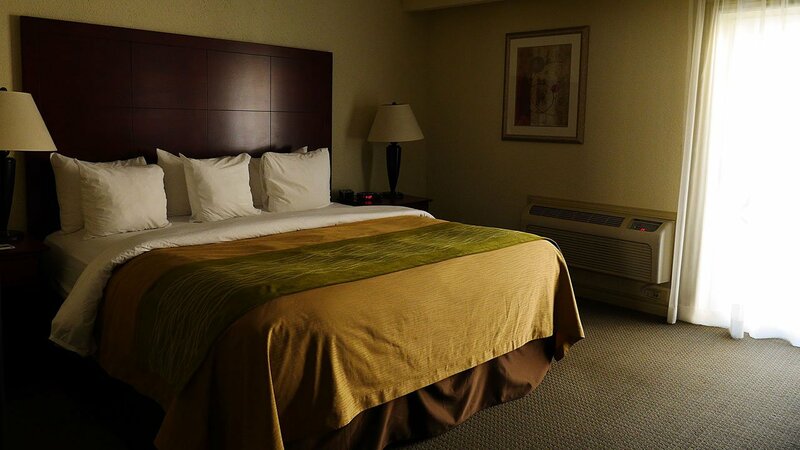 After a filling dinner and an equally fulfilling day, we sluggishly walked back to our room at the Comfort Inn & Suites. 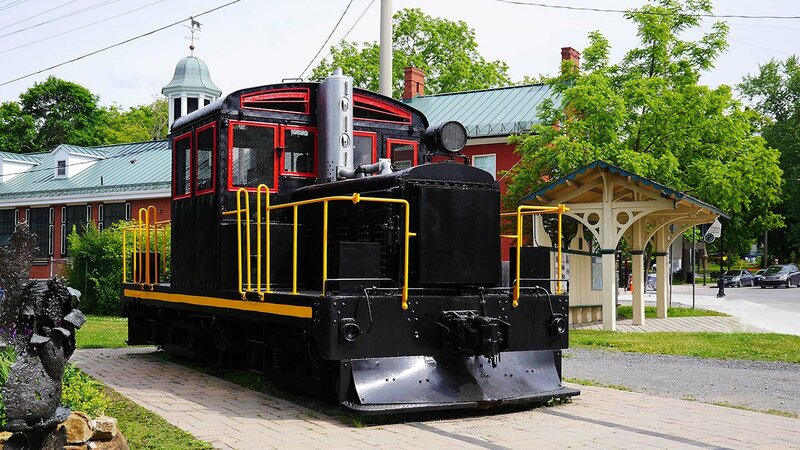 The hotel itself is located in a prime location on Main Street which is conveniently close to the waterfront, and downtown Gananoque. 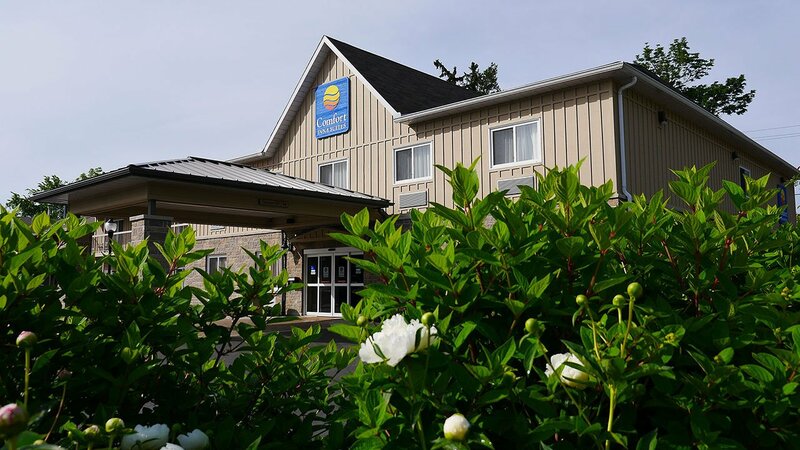 The Comfort Inn is packed with amenities including an indoor pool, sauna and fitness centre – as well as a deluxe continental breakfast for all guests. We crashed pretty early that night, and I gotta tell you – that king-sized bed was definitely a welcome sight after a full day of paddling out on the river. 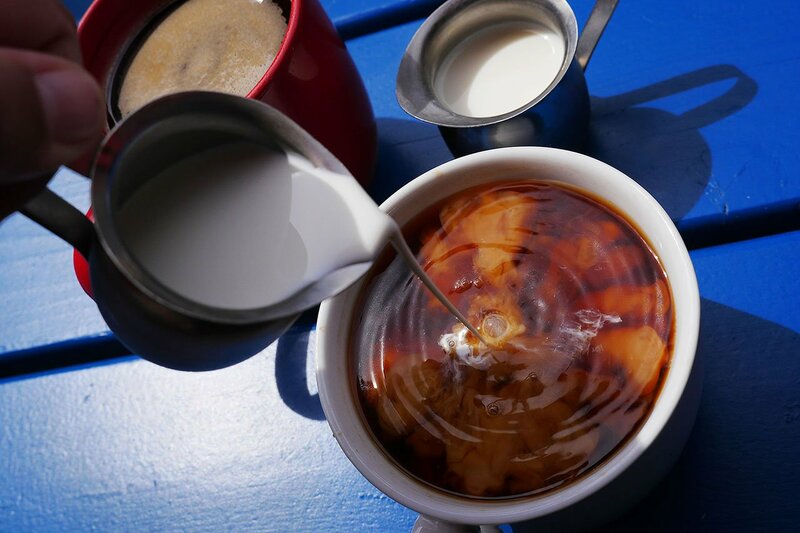 The next day, we awoke with the sun and snacked on some yogurt and fruit at the breakfast area while enjoying a cup of coffee. The air was filled with the smell of waffles and other delightful aromas – but we stuck to lighter fare so early in the day. 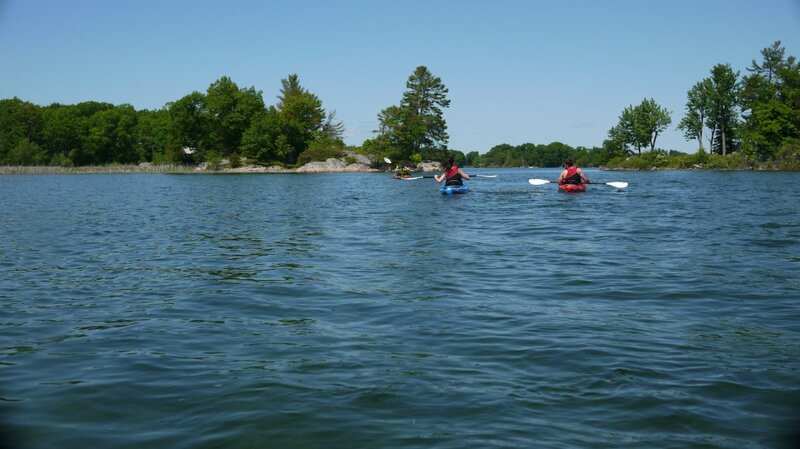 Besides, we were anxious to get outside and explore more of Gananoque’s scenic areas! 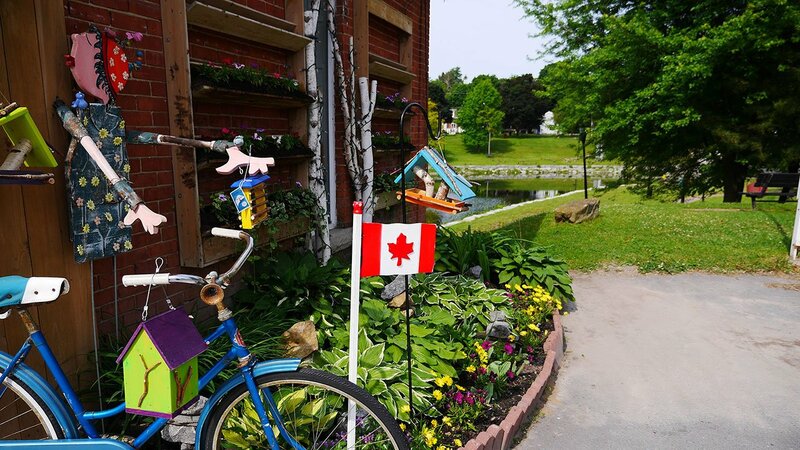 Overlooking the Gananoque River from the bridge over King Street bridge is an iconic and adorable little artisan shop, carrying the collective works of over thirty local artists and makers. Here in The Little Pump House, you’ll find fantastic trinkets, toys, vivid artwork and ideal gifts for friends and family back home. It’s a great place to get all of your #LifeonTheRiver gear and browse some amazing creations by local artists like Cracker Crumbs Studios, Sally Chupik and more! I always love checking out the work of local creators and the Little Pump House is packed to the brim with treasures. 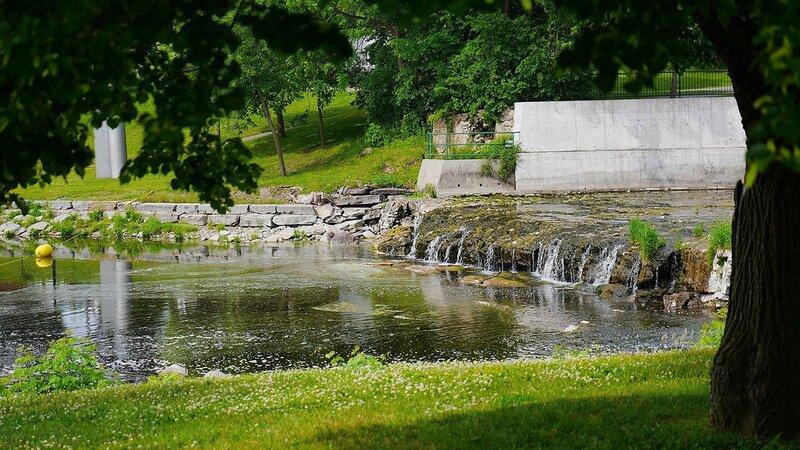 No trip to Gananoque is complete without a relaxing walk through Confederation Park, especially at the dawn of the summer season! 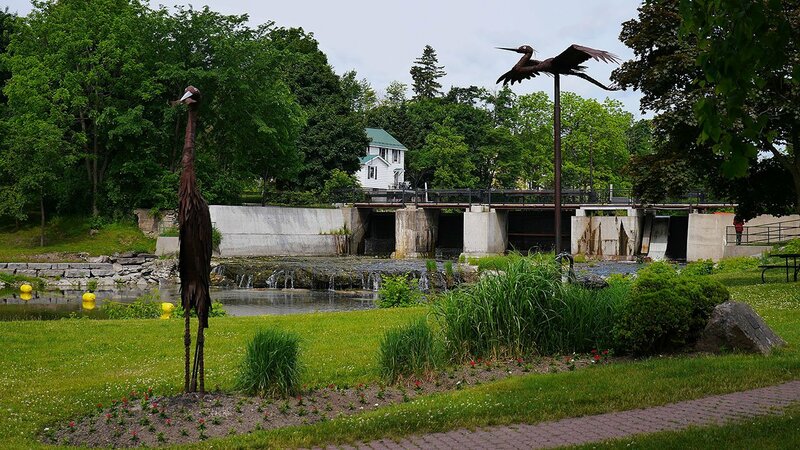 This time of year, the park is teeming with life as geese, ducks and even swans take up residence in the nearby Gananoque river. 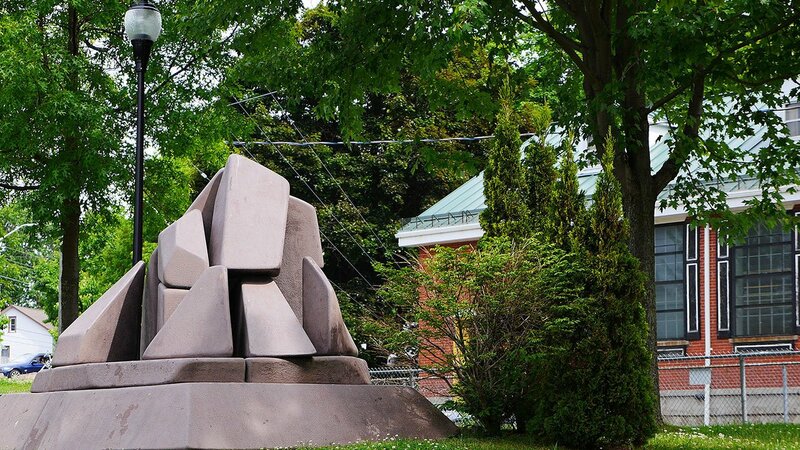 There’s also a wonderful sculpture park to enjoy, making this park a must-see for visitors and locals alike. The last time Heidi and I visited Confederation Park it was during the winter, and the visual change between then and now is truly spectacular. It’s a prime spot for a walk, picnic or to sit and watch the various birds come and go. After spending about an hour walking throughout the park, we made our way back across King Street to find ourselves some breakfast at a particularly popular local eatery and cafe right across from Confederation Park. 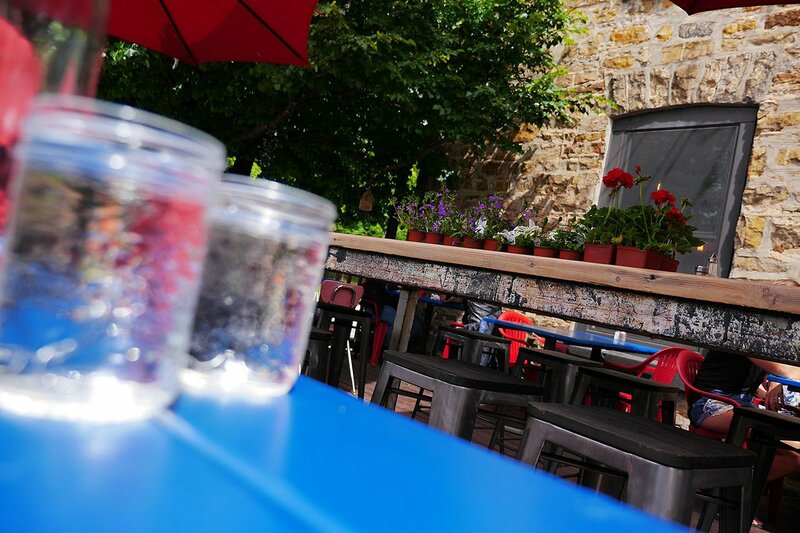 Situated in Gananoque’s historic and beautiful Axleworks building is the eclectic and oh, so chill Laverne’s Eatery. This wasn’t our first time visiting Laverne’s but it was the first time we’ve been there during the summer. 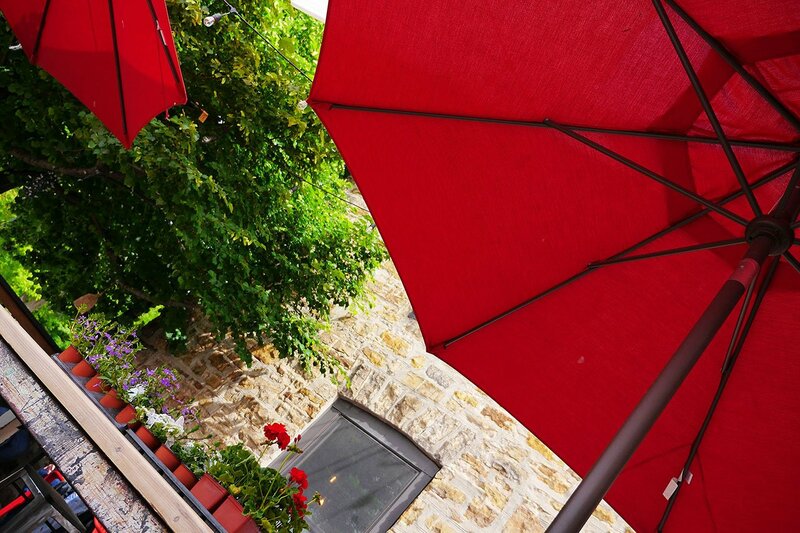 We easily found a table on their charming patio, and before we knew it, we were relaxing on a sunny Saturday morning in a beautiful outdoor setting. 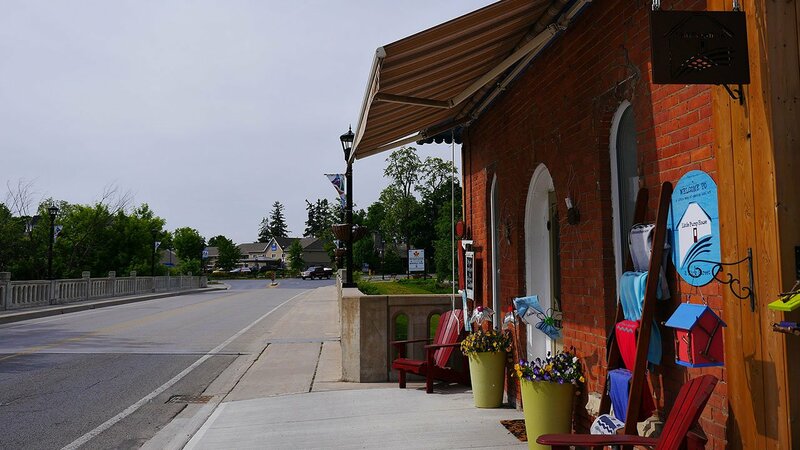 Laverne’s sports a legit cafe and can fix you up some seriously well crafted caffeinated concoctions bringing a fantastic piece of the big city to the little Town of Gananoque. The coffee is superb, and they can make one heck of an Americano. 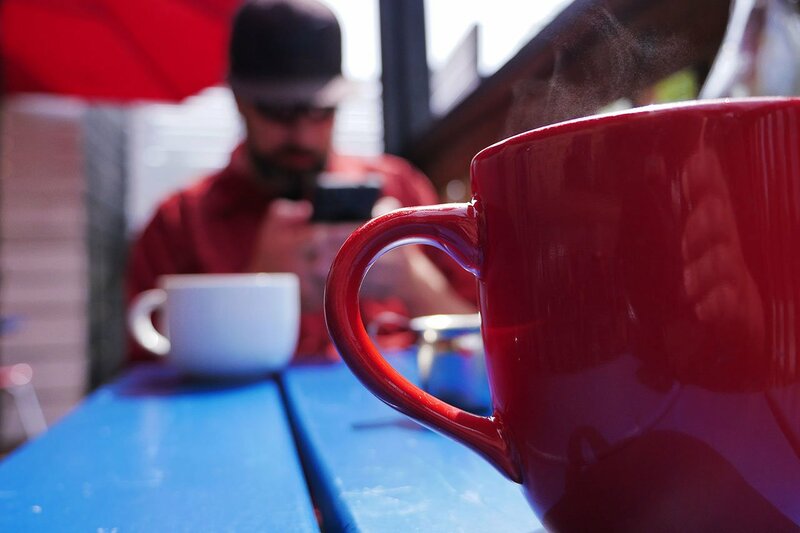 As we relaxed on the patio and enjoyed our coffees it was a good time to post some Instagram stories before ordering our breakfast. The menu is filled with several amazing choices – and in the end, Heidi selected Laverne’s take on the classic breakfast special. 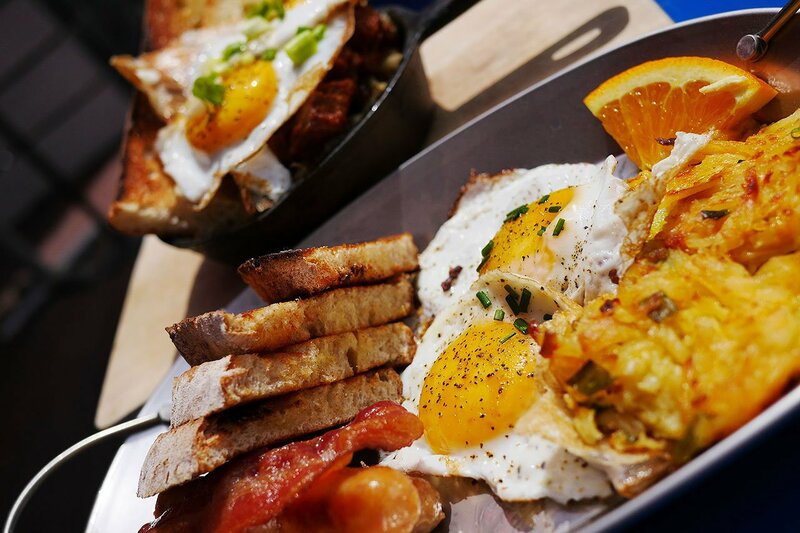 Entitled The Spoon, this generous platter came with two fried eggs, house-made hash browns and toast, as well as both bacon and sausage. 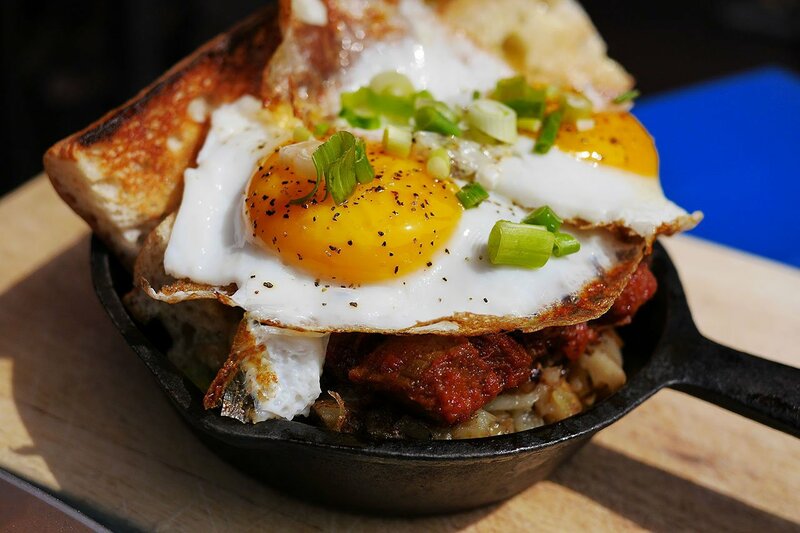 After reading about the Brisket Hash, I instantly fell in love. This epic breakfast combined smoked beef brisket, Laverne’s signature BBQ sauce, potato and onion hash and fried eggs. It also came with two pieces of golden buttery toast resulting in a divine meal fit for the gods. I’m sure that Laverne’s is just a side-gig for the head chef of Valhalla. The food at Laverne’s boasts some of the most Instagrammable presentations I’ve ever encountered at a cafe. I wasn’t sure if I should eat it, or frame it. This is the standard by which Laverne’s operates. The food pictured here wasn’t prettied up for this blog – as Heidi and I never announce our visits to restaurants in advance. 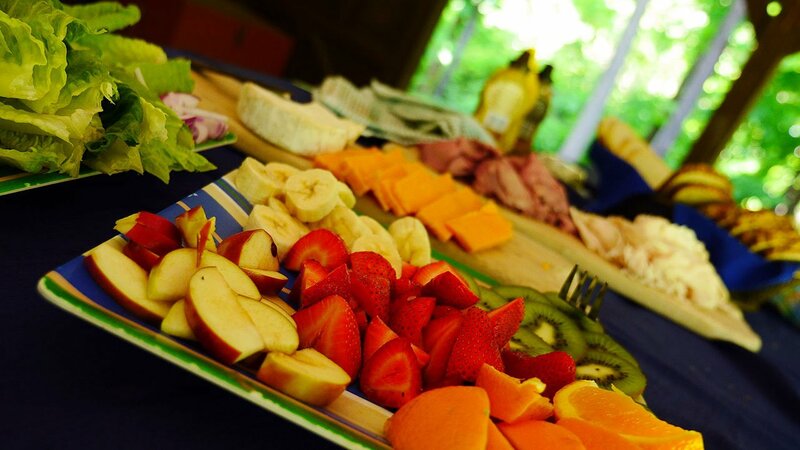 What you see pictured here, is how they roll at Laverne’s. As expected, the food was just as amazing as it looked. It was a truly delicious ending for an already monumental two day escape to Gananoque! Thanks for reading our story! 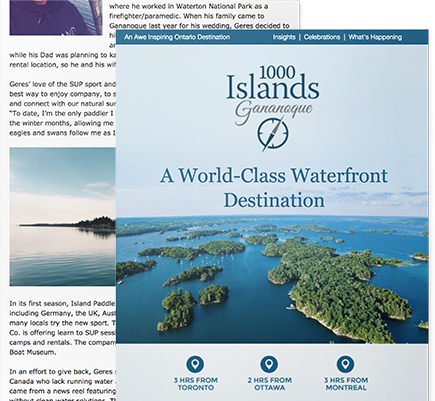 I hope we’ve inspired you to visit The 1000 Islands – and discover an entire world of experiences just waiting to be found. As always, we’ve hooked you up with a custom Google Map to help you create an unforgettable trip of your own! 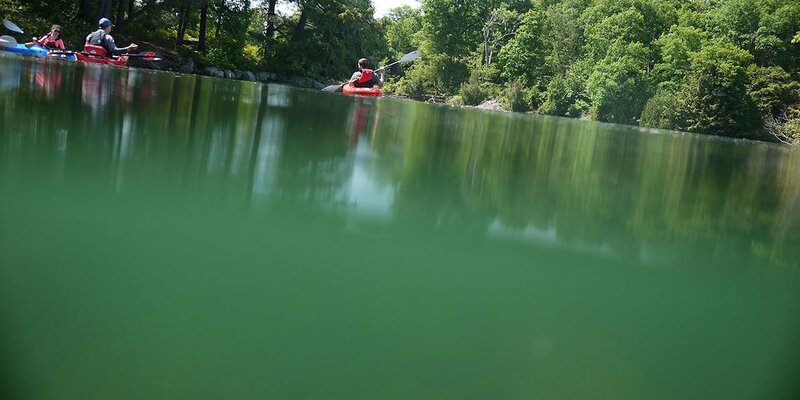 Anyone who has spent but a portion of their life on the river can agree with me – that once you set out upon her waves, catch that huge bass, swim in the cool clear waters, roast marshmallows at an island campsite, or just watch the sun slowly melt into the horizon… You’re forever changed. The river stays with you. She captures a fragment of your soul – and forever thereafter you’re counting the off days until you can see her again. Very Good. One thing you could have mentioned is that Half Moon Bay has been a summer place of Christian worship since 1887. Go to www.halfmoonbay.site for details.